Your customer hasn’t paid your invoice, it’s overdue and despite sending reminders and a statement, the money still hasn’t appeared in your bank account. It’s time to pick up the phone and make that call. But you’re hesitating because nobody likes having to chase late payment. In this article I explain a few techniques for making those calls, getting to the point without upsetting your customer but getting your invoice paid. Before you jump to conclusions, there could be a whole host of reasons why your invoice hasn’t been paid so find out why first. It may be your fault. You sent it to the wrong person. The person you’re dealing with isn’t necessarily the person who pays the bills. The invoice you sent by email got marked as spam and they don’t know they’ve got it. They have a question about the invoice and haven’t had a chance to ask you about it because they’ve been busy. Missing information on your invoice, like you haven’t stated how or when to pay you. 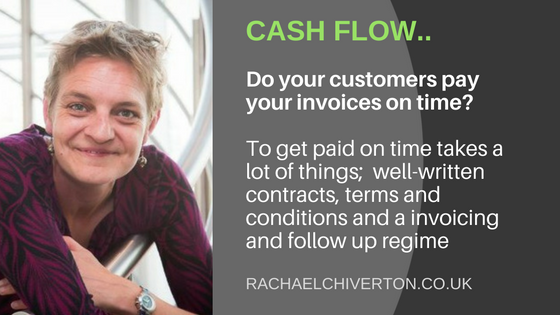 (yes, you’d be surprised how often this happens) see information to include on an invoice. They cannot match your invoice with their purchase order. They haven’t got the money to pay you. As you can see there’s all sorts of reasons why invoices don’t get paid. Some are perfectly reasonable, and some are more serious. Knowing the reason puts you in a much better position to deal with it. Hello, this is Bob. Is this a good time to have a quick conversation? Great, thank you. I’m calling today because I don’t seem to have received payment for invoice 345. By starting the conversation in this way, you’re being clear about the purpose of your call but not blaming the customer. Er, sorry, I’m busy right now. Okay, that’s fine. When would be a better time for you? Can you call me in two hours? Make sure you follow up and keep to the time the customer said. That way, they are suggesting the time and you won’t feel like you’re being pushy or a pain if you call again. Be confident in your conversation and make your point clearly. Think about what you’re going to say and have your script prepared. The way you communicate can make all the difference. This month, at the Cash Flow College we’re learning how our attitude and communication styles can help you get paid on time.